To scout wild game or to trace any proof of vandalism or breach of security in the precinct of your homestead needs the best trail camera. This is the hunter’s best friend for clandestine scouting over a chosen area. Without these cameras, hunters may have to randomly scout for the wildlife in uncertain places or homeowners may not be able to trace the intruders. These cameras give them an informed decision of what kind of wildlife or intruders frequent their targeted areas. 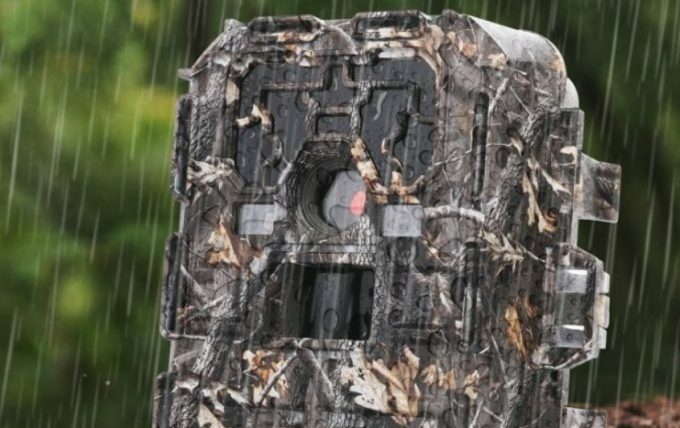 If you are an avid hunter, you have to get these inconspicuous outdoor trail cameras to detect any covert activities. They are equally essential to enhance your home security in case you suspect any intrusion or have witnessed vandalism at your homestead. So, investing in these cameras is the best decision. They come with innumerable features to choose from. Choosing the best trail camera for the money may be a challenge for the inexperienced, noting that there are hundreds of products on the market. 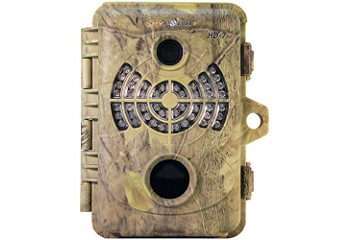 We have thus compiled an appealing list of trail cameras in this review for you. Their comprehensive features have also been unfolded. Because of a plethora of features that these cameras come with, it is thus important to get to know them beforehand so you can make an informed purchase. It also helps you relate to the actual features you will need for your clandestine hunting. Among other features, you may take into account the battery life, image quality, trigger speed, recovery time, detection range, type of the camera and affordability. 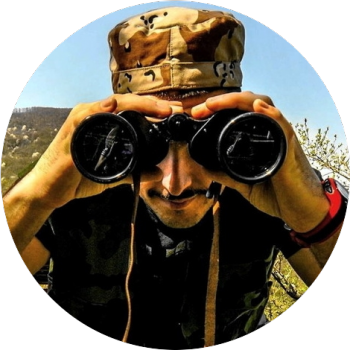 Without the proper image quality, you might not be able to reveal the details of your targets. The quality is enhanced by the number of pixels the camera has. Usually, average cameras have pixels ranging from 5 to 7MP. The high-end ones can even reach up to 20MP. The higher is the better and the higher is the more priced. You can still find the ones with 2MP. These will surely provide an inferior image quality but are affordable for those with limited funds. 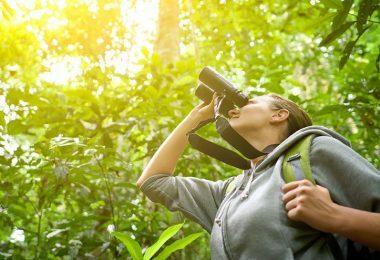 If you are fully committed to the hobby of hunting or scouting, then consider the cameras over 7MP because of the image quality they are capable of providing. It is particularly important to consider higher megapixels when using the camera for nocturnal hunting. An inferior one may be abysmal in providing crisp images. The purpose of using the camera also dictates which megapixel to choose. If you only intend to detect the movements at night with the infrared camera, then you might compromise and consider the affordable one below 5MP. But, for wildlife photography, you must hit the higher megapixels. The speed at which the camera is triggered to take a shot after the sensors have detected the movement is the trigger time. And the speed at which the camera can take the next shot after saving the first capture shots is the recovery time. Here lesser is better. In a lay man’s term, when the animal is spotted in the detection zone, the camera will sense the movement and then promptly take a shot. If the trigger speed is less, then it will manage to capture any animal no matter how fast it passes the detection range. Usually, the high-end trail cameras have a trigger speed less than a second. Any trigger speed that is more than second is not an ideal solution, unless if you are targeting huge animals such as elephants. If you find a trigger time of about 0.2s, you have found a great tool. The recovery time also needs to be convenient and fast so that you can capture the next shots. Some recovery times are adjustable. The more space of the SD card you have is the better because the images will be saved with ease without capacity limitations. But check with the manufacturer that what is the recovery time. Battery life is one of the most important features of these cameras. It will be disappointing to set up your camera and leave it unmonitored for a long time, but then return to find out that it had been off since midnight and as a result, you’ve missed out on captures. Wild game can last for many hours or even days. So, you need a powerful power source that will last or capture as many images as possible. Some products indicate that how many images can be captured before the power is cut. Keep in mind: The more features your camera has can consume more power expeditiously than the recommended time. An incandescent flash, for example, consumes more power than the infrared does. Even a type of the camera can add to that. The cellular camera has lots of functionality that includes WIFI and automatically streaming the images to your cellphone. Such features consume more power. Some cameras have the ability to use the external power sources. They come with more plug options. It is also important to choose carefully the battery that is more powerful. Most cameras do not come with batteries, so follow the recommendations given by the manufacturer. 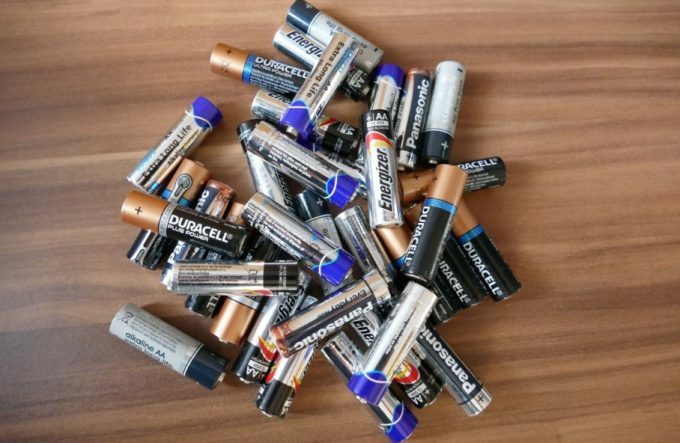 Alkaline batteries are less powerful compared to lithium batteries. You’ll want to keep this mind when purchasing. The range depends on the size of the area on which you want to use the trail camera. If you intend to use it in scouting your homestead, the higher detection range may be rendered worthless. Perhaps a detection range of 40ft can be suitable. Bear in mind that the longer detection range comes at higher prices. If you plan to scout a large area, then the detection range should be long enough. Normally, you might find it over 100ft. Such range is an ideal solution for hunting on a farm or a larger wild area. On average, the popular cameras have a range of between 60 to 80 feet.It will help you capture your target easily as long as it is within the detection zone. But, equally, the recovery and the trigger time should be impressive enough in line with the detection zone. There are various models, which include wireless, cellular, infrared and flash cameras. Each of these has some dis- and advantages to consider. They also come with innumerable features. If you want to receive the covert activities directly to your phone, then consider the cellular trail cameras. However, you have to insert the compatible SIM card on these models. A network and data plan is needed for its functionality. The wireless camera is exactly what it is as its name implies. No wired network connectivity. A wireless network is needed to connect the receiver device. The cameras are convenient and user-friendly.On the other hand, the infrared cameras are renowned for their inconspicuous nature and their superb nocturnal performance. 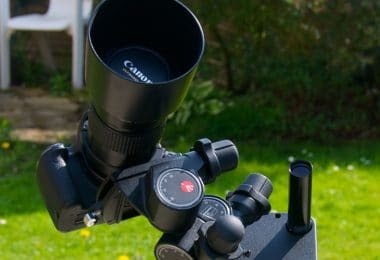 They have a higher resolution at night and thus provide clear and great images of your targets. Furthermore, they are easy to install and configure. The flash cameras are also good in providing great and crisp images, especially at night. What we like is their versatility during the night or the day. They are very portable cameras and relatively easy to install. However, they may not be good for hunting or scouting for your enemies because of the flashlight.The flash might agitate the animals or scare them off. For security purposes, the intruders will notice the presence of the cameras and might devise alternative intrusion strategies. Moreover, the flash might be annoying to your neighborhood. 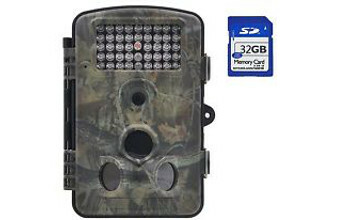 Due to the fact that these trail cameras continue capturing as many pictures as possible, one needs an ample storage. Once the memory is full, the device might not be able to save further shots. So you must be careful of your memory selection. Most of the cameras come with compatibility for SD card up to 32GB. Some may exceed that. Unfortunately, these memory cards are sold separately. Beware of the brand to be purchased. Or rather, consider the recommendation by the manufacturer.If your camera captures multiple shots per single capture, then you need a huge memory. You may continue monitoring the camera so as to delete the unwanted images to free up some space. We may have different high-end trail cameras that we wish to purchase. However, our pockets have the final say. You may spend as low as $70 or as high as $10000. But obviously, the low-priced cameras come with inferior features that may not be appealing to the professional hunter looking for more detailed images. But sometimes it does not necessarily mean that the expensive ones are suitable for your professional clandestine hunting. You can trim off the features that you do not need to make sure that the camera is still affordable. Having discussed the things to consider, we are confident that you are ready to find out the best model. 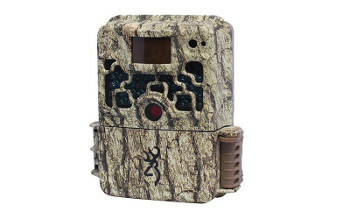 Below are the trail cameras that we have handpicked for you. Specific features: Resolution of 12MP, detection flash range of 50ft, video of 480px but no audio, infrared range of 850nm and trigger speed of less than a second. The Moultrie A-20 Mini Game Camera can be the ideal trail camera you have been looking for with extensive and appealing features. It is an upgrade from its predecessor, A-5 Gen 2 camera. This one is the hunter’s best friend to capture high-quality images with its resolution of 12MP at a detection range of 50 feet. That is sufficient for use in small areas, especially your homestead for security purposes. For nighttime use, the infrared long-range of 850nm is a great choice. It will help you capture any image within 50 feet. The trigger speed of less than 1 second is something impressive because you will be able to capture any wild game at higher speeds. You might fall in love with the compact size and the user-friendly interface. Reviewing what has been captured is made possible by the ample LCD screen on which you can maneuver the settings or even delete the unwanted footage. The company offers a 2-year warranty for this product. The camera uses wireless connectivity. It runs on AA batteries that are sold separately. An external power source of 12V DC or AC can be used to enhance its power. In terms of memory capacity, it supports an SD card up to 32GB. It works well with the SD/SDHC class 4 cards. And for more light, 32 LEDs are featured on the infrared flash. The camera further comes with 2 resolution settings at 1600 x 1200px and 4000 x 3000px. Other features include multi-shot per single trigger. The contents of the camera will be protected by the sturdy weatherproof case and can be attached to a tree using the python cable. 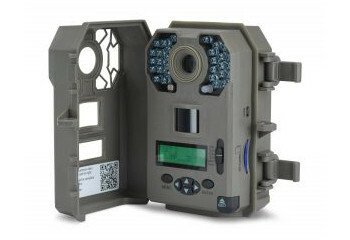 Related: The Company also offers the Moultrie A-30 Game Camera with a trigger speed of 0.7 seconds. Most of the features are the same. It has 24 LEDs featured and has a higher detection range of 70 feet. Specific features: 12-megapixel 1080p resolution, 2.4” LCD screen, 42 IR LEDs, 0.2 -1s trigger speed, 3 pictures multi-shot, 120-degree field of view, 65 feet detection range. 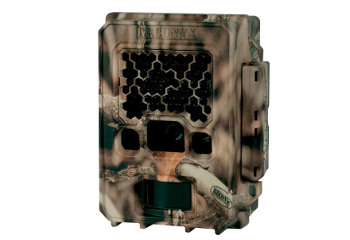 Looking for an affordable trail camera with a lightning speed of trigger time? ZenNutt HD Wildlife could be an ideal choice for you. It comes with a trigger speed of between 0.2 to a second and zero delay between triggers. Within that short period of time, 3 pictures will have been captured. It can be a great tool for wildlife photography with 12 megapixel and 1080p resolution. These features are impressive for your nighttime captures and for images of premium quality. 42 LEDs are featured for the infrared to enhance the visibility of the targets. With the 2.4” LCD screen, you will be able to review the captured footage or delete the unwanted footage. The 65 feet detection range is sufficient to be used on a wide area with a field of view of 120 degrees. Night vision is effortless with this camera. It is also waterproof in case you face the downpours in the outdoors. Even the inexperienced users can find this camera very intuitive and easy to configure. There is no setup whatsoever to use it. Users can embrace even more extensive features such as multi-shot, password protection, printing of time on the captures, an indicator for low voltage, and the flawless camera design. The threaded insert underneath enables it to be mounted on the tripod (sold separately). Related: The Company has the lower range trail camera that is more affordable. 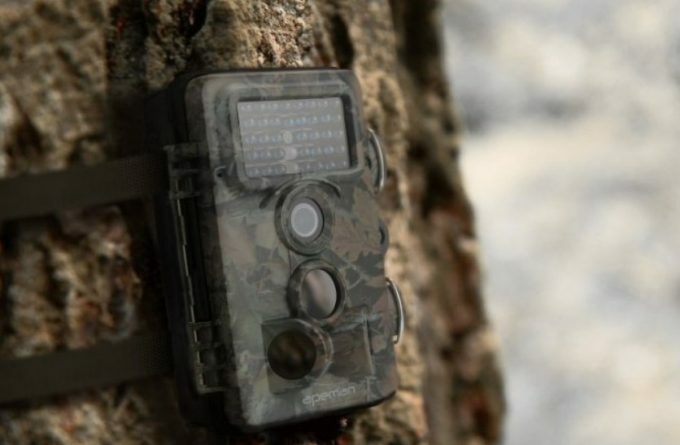 It’s the ZenNutt Trail & Game Camera and still comes with great features for your spy needs. It has, among others, 8MP and 720p of resolution. 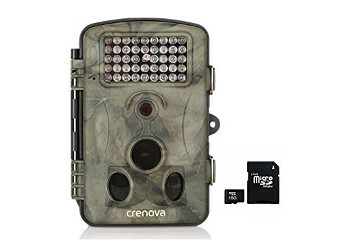 With this scouting trail camera, you have the privilege to view high-quality images captured with 12 megapixel and 1080p resolution. Whichever wildlife within 65 feet, it can be captured at a trigger speed of a second. For night time hunting, the 42 pcs IR LEDs come to your rescue with 120 degrees wide angle of detection. The Crenova Game And Trail further offers the easy-operating multifunction such as time lapse, multi-shot, user-friendly system, and intervals. It is compatible with AC power sources so you can enhance its power. The Company offers a 1-year warranty. With the integrated PIR sensors, you will never miss out on any movement in the precinct of your trail camera. They activate the camera automatically to capture and to record your targets with the HD video. The date, temperature and the time can be printed on the footage. This makes it ideal for home security to trace the exact time that the intruder had invaded your home. The camera can function under temperatures between 20 to 60 degrees Celsius. With Day 6 Plotwatcher Pro, you can analyze your targeted hunting area. It helps you get prepared so that you can go to the right place which you are certain about the frequency of wildlife because it takes pictures for every 5 to 10 seconds each day. It can take up to a million images. This is sufficient enough to capture almost everything. You have to insert the SD card of up to 32GB to save more images. There is no remote sensor to trigger the captures here. With the 2.5 inch LCD display screen, you can watch your favorite moments captured. 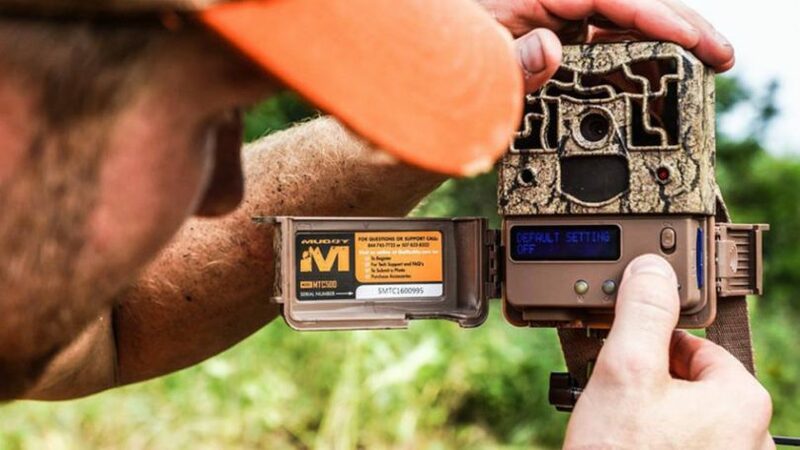 There are plenty of features that come with this trail camera. It can capture from 30 to 300 feet. This can be likened to spending a whole time scouting wildlife with naked eyes. The battery life is also powerful. You need to get the 8 AA batteries separately. With the Reconyx Hyperfire Semi-Covert IR, you can capture images up to 50 feet away using a higher resolution of 1080p. Up to 2 frames per second of video can be captured. For power needs, you can use either 6 or 12 AA batteries. 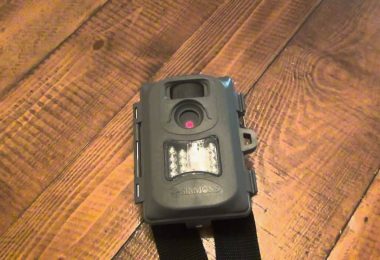 This trail camera can be best used at night time too. It can illuminate up to 50 feet in the total darkness. Your captured images can be stored in a memory card which is expandable to 32GB, either be SD/SDHC. The Ultra HD IR camera lens will deliver crisp and crystal images than other competitors. 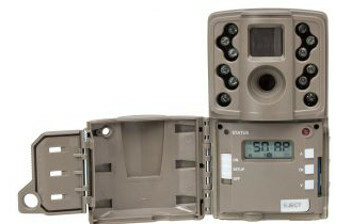 The temperature range of 20 to 120 degrees ensures that the trail camera can be used in a variety of outdoor conditions. Related: For security purposes, you can get the Reconyx Hyerfire Security Enclosure offered by the same manufacturer. It is powder-coated and corrosion resistant. 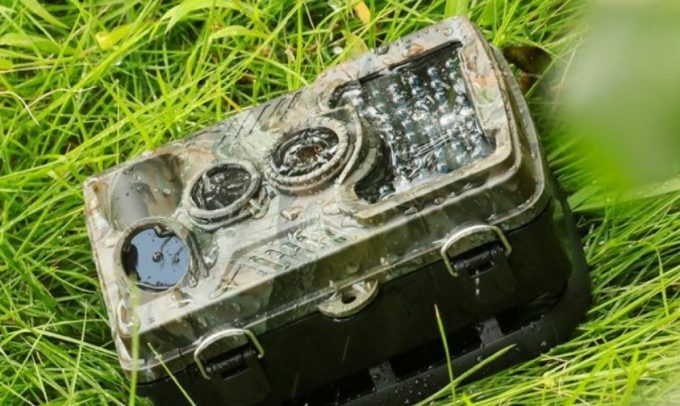 Considering that this trail camera may be left unmonitored in the wilderness, you need this security enclosure. Specific features: 3 resolutions (8MP, 4MP, and 2MP), 5 to 180 seconds HD video recording with audio, a trigger speed of less than a second, 30 IR emitters and 80 feet detection range. If you are looking for a much larger detection range then this trail camera might be suitable for your desires. 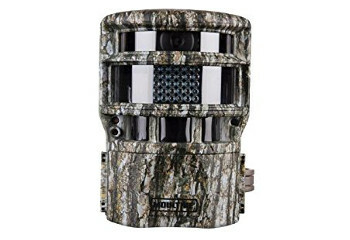 The Stealth Cam G30 Trail Camera delivers a range of 80 feet with 30 IR emitters. The dim lights and the night darkness will not distract its functions. A lightning speed trigger time of less than a second will ensure that you capture most of the fast-moving targets as soon as the sensors detect the movement. The camera further features the matrix advanced blur reduction to expose all the details of your target. It also has the 16:9 wide image ratio and the burst mode wherein 1-9 images may be captured per trigger. The recovery time is 5-59 seconds. Your captures may have the moon phase, date, time and temp printed on them. There is also the GEO-Tag GPS tagging. Various languages are featured, which means that everyone is covered regardless of country of origin. English, French, German and Spanish is some of the languages featured. And to save your footage, the camera supports an SD card up to 32 GB. So, you won’t miss out a shot because of limited storage. The trigger speed of 0.75 seconds can continue capturing amazing moments. There are plenty of features that could be appealing to every hunter. The 8MP and the HD video recording with audio deliver the sharper and crisp images. And the Rapid-fire Burst Mode allows you to capture from 1 to 9 images per each trigger. Rest assured that no one will tamper with the settings because it features the Secure Lock digital protection with password protection. Related: To secure your camera, we recommend considering the Stealth Cam Security/Bear Box for G SERIES Camera. It is an important accessory when considering the fact that the camera may be left unobserved in the wilderness. The Spypoint Hd-7 Infrared Game Camera comes with a resolution of 7 megapixels and 720p to provide better images at an affordable price. The video recording comes with the sound so that you can hear what your enemies have been conspiring about. The 5-zone sensor helps provide a much faster trigger time to capture even the fastest wild game. The internal camera is removable, so you can replace it with another model that has much higher resolution provided they are compatible with each other. The SD/SDHC cards are also removable and it supports up to 32 GB, but they are sold separately. To power the camera, you need 6 AA batteries that will surely last you a long time. It is also compatible with the LIT-C-8 lithium rechargeable battery pack which is sold separately. Included in your pack are the USB cable, video cable, and the mounting strap. Related: To purchase the memory card, consider the SanDisk 32GB SDHC Flash Memory Card for approximately $15. It will help you store your favorite footage. The Moultrie Game Spy Panoramic Camera delivers stunning features such as the 3 infrared motion sensors for the best capture of your targets. 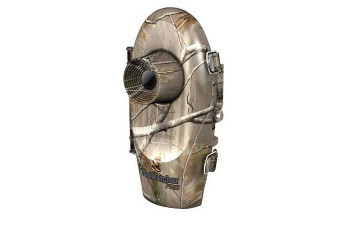 It has 150 degree of detection angle, which is a larger area to capture most of the wild game. Its 8MP resolution delivers sharper images in combination with the infrared LEDs at 100 feet. Also, exciting with this trail camera are the 5 operational modes. These include day and night video, IR triggered camera by night, time lapse plot camera, panoramic trail camera, and IR triggered trail camera. The Silent slide lens rotates and captures videos or photos silently after the sensors have detected any motion. The camera features Multi-shot wherein 1 to 3 images can be captured per trigger. There is a programmable recovery time of 5/15/30 seconds, 1 to 60 minutes. In total, the camera can take up to 9000 images before its batteries run out. It operates on 6 C batteries which are sold separately. And to store footage, the camera can take up an SD card up to 32 GB, which is also sold separately. To set up this camera in the wilderness, the integrated strap loop with Python cable has been provided so that you can mount on a tree or any sturdy object. The trigger speed of this camera is less than a second. This ensures that even the fastest animals are being captured rapidly. And to view your footage, the LCD screen interface is easy to navigate and maneuver. The other buttons on the front of the LCD help with low-light viewing. For night illumination, the flash features 30 LEDs with a long-range of 850nm. It can detect up to 100 feet in the darkness. Related: For security reasons, we recommend the Moultrie Camera Battery Box to secure your camera until later use. 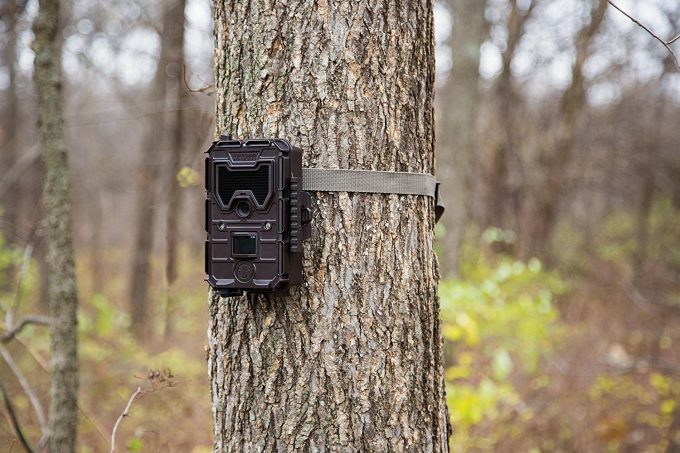 Setup your camera in the wilderness and protect it with this camera box. This trail camera is a perfect feature for wild game monitoring or to scout your homestead looking for a possible invasion. It captures videos and videos simultaneously per every trigger and can capture 1 to 3 images per trigger. Its recovery time is programmable from 1 to 60 seconds. 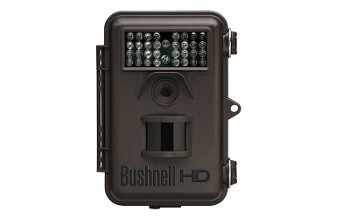 The Bushnell Trophy Cam delivers quality videos and good images with its resolution. The footage can embed the GPS coordinates or print the time and date. It is powered by 8AA batteries that can last up to a year before replacement. The SD card up to 32GB can be inserted to save images. The adjustable web belt and the ¼-20 socket help in mounting the camera in the wilderness. You can also use it in the night. It has a Hyper Night Vision feature to capture footage without distractions with a trigger speed of 0.6 seconds. 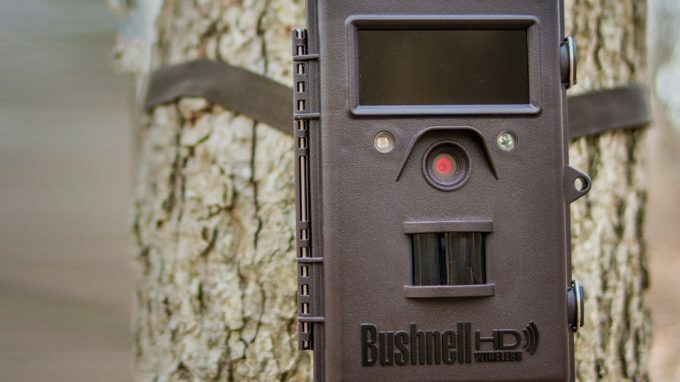 Related: To deter any theft of your camera while leaving it in the outdoors, you can consider the Bushnell Bear Safe Security Case for Trophy Cam Trail Cameras. This is a must-have accessory because your camera might be visible to intruders who might steal your expensive product. The Browning Strike Force brings you the joy of spying wildlife with a 10MP camera resolution. This resolution is high enough to provide you sharper images than most of the camera do. The trigger speed is also impressively fast to capture accelerating wildlife up to 100 feet. Even in the dark, the flash can illuminate up to 100 feet. HD videos can also be recorded with varying length from 5 seconds to 2 minutes. All these can be saved in the SD card up to 32GB to be purchased separately. The camera is compact and lightweight and at the same time feature-rich. It has Zero Blur Night IR photos, which ensures you great images in total darkness. For just $120, this can be affordable for most hunters as it is the best game camera for the money. Related: To fasten it to a tree in the wilderness, we recommend purchasing the Master Lock Python Adjustable Locking Cable. It will help secure the camera from any theft. 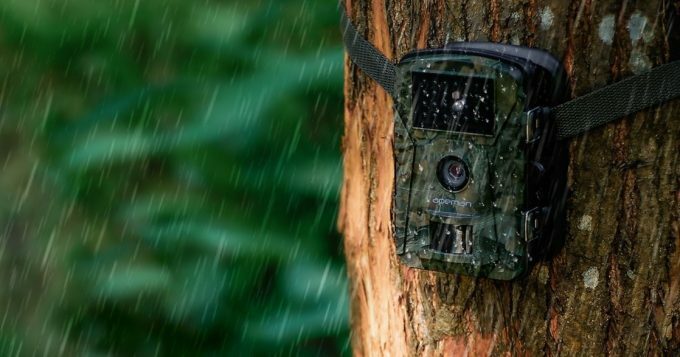 We have come to an end of our top-rated trail cameras on the market that we believe could be your best partners for your hunting desires. The important aspects have been emphasized such as the camera resolution, the trigger speed, the detection range and the recovery time. It is thus important to familiarize yourself with them. Have you ever used any of these products? If yes, then please share with our readers your experience in the comments section below.